Join the discussion on our forums! Come discuss Necrium Blade over in our dedicated Necrium Blade discussion topic. Deathrattle: Trigger the Deathrattle of a random friendly minion. Grab death by the handle. The weapon by it self is bad, especially in rogue because of rogue hero power. Shadow blade the 3 mana 3/2 that makes your hero immune sees no play so you HAVE to get some value off the deathrattle effect. Problem is as of now death rattle rogue isn't a thing. Save that second swing for Mechanical Whelp. Yikes! Hmm... Leeroy Jenkins + Carnivorous Cube + Necrium Blade = 21 to the face? this does nothing with mecha'thun. he would be in play and thus the deathrattle would do nothing. Ignore the downvotes, this is true. Mecha'thun counts itself for its deathrattle. You must have an empty board, hand and deck to win. Screw this + new cards, remember Kobold Illusionist? This is Malygos Rogue's Twig. Wow, that might really works. Kinda complicated in Standard since Gadgetzan Auctioneer don't work well anymore. Man Fiery War Axe keeps getting worse and worse as time goes on... anyways, since you have control over when the deathrattle goes off in most cases, this could be a very good way to trigger deathrattles without actually having to give up a minion. Very cool. Wow! Gonna build a deck with this weapon and Southsea Squidface + 26 other cards I wouldn't care about because this combo is broken! If you use the weapon until it's deathrattle triggers, you WONT HAVE A WEAPON for the Southsea Squidface to buff in the first place. I think it's finally time to introduce "silence a weapon" mechanics. 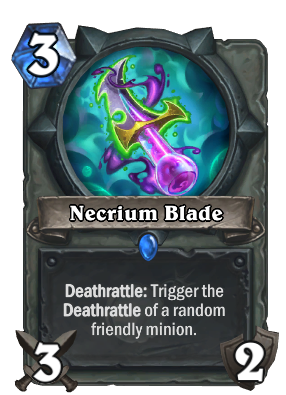 Apart from the fact that it doesn't look like weapon, it might find a space in deathrattle decks. Let's wait for more deathrattle neutral minions.